The slow cooker must be one of the greatest kitchen inventions ever. It’s especially great for making soups or stews, as they are usually really easy to assemble and leave to cook while you’re working or running errands—and with the warm option, it’s unlikely to overcook. 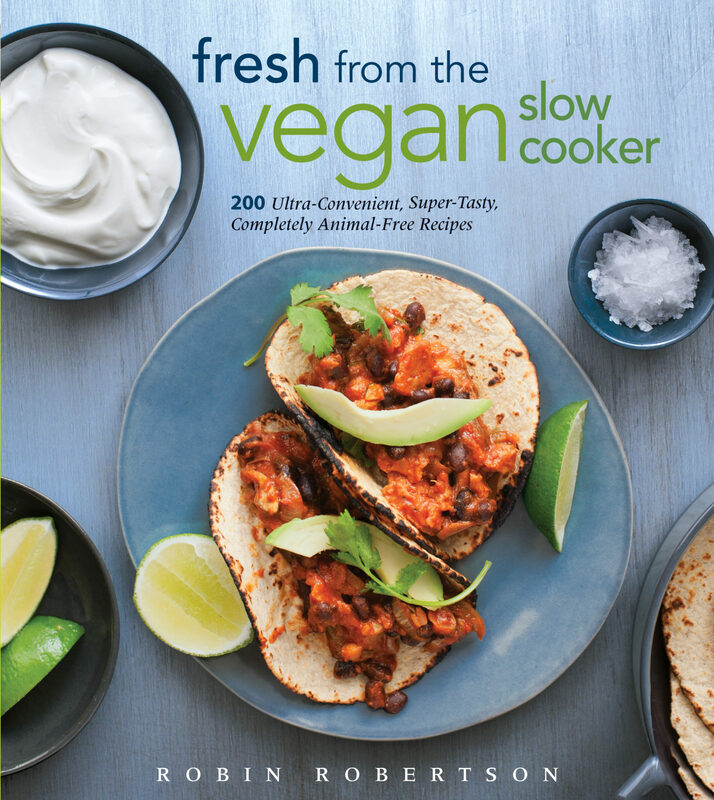 My favorite slow-cooker cookbook is Fresh from the Vegan Slow Cooker: 200 Ultra-Convenient, Super-Tasty, Completely Animal-Free Recipes by Robin Robertson, and one of the reasons I love it is because of the layout of the recipes. Beyond your typical organization of recipes around type of food or drink, the recipes are very easy to read, with tips and indications as to whether they are soy free or gluten free in addition to being vegan. They’re sleek, which is also nice. A number of cookbooks I see tend to be cumbersome in words and layout, but not this one. While I usually focus on the soups and stews, there’s a lovely breakfast section in Fresh from the Vegan Slow Cooker as well. I highly recommend making the pumpkin quinoa “oatmeal” recipe in the fall—prepare it overnight, and it’s ready to eat before you leave for work with the added bonus of waking up to delicious smells. As you might have guessed from the title of this article, there’s also a great dessert section. Some of the recipes require items I don’t have, like a springform pan or a bread pan that would fit inside the slow cooker. However, the recipe for an apple dessert, titled Maple-and-Rum-Glazed Slow-Baked Apples, is delicious and fitting for a cold night and doesn’t need any extra kitchen equipment. The first thing to do after washing the apples is to core them about three-fourths the way down and then peel about half an inch to an inch from the top (see photo). Rub the lemon juice on the part that’s been peeled; it helps prevent the discoloration that apples are so prone to. 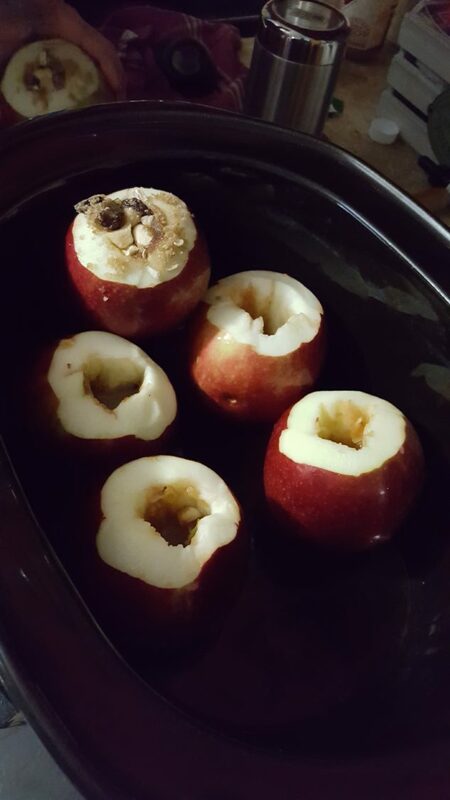 Place the apples in a single layer in your six-quart slow cooker. 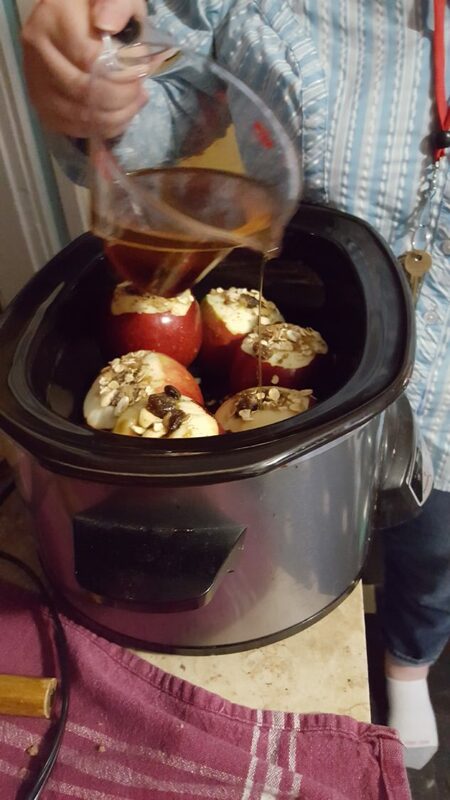 Thoroughly mix the rest of the main list of ingredients and stuff it into the apples where the cores were. There’s enough that it’s okay for the filling to overflow if you’re using average-sized apples. When I made these, I used a certified gluten-free oatmeal from a local co-op grocery store, and instead of macadamia nuts I used cashews, since they are delicious! Kraken was my rum of choice; I use it in a lot of boozy cooking and baking. The glaze ingredients, once mixed in a small bowl, should be poured over the apples—it’ll fill up a good portion of the bottom of your slow cooker. Cook everything for about two to four hours on low, until the apples are soft but not collapsing. Immediately remove the lid. 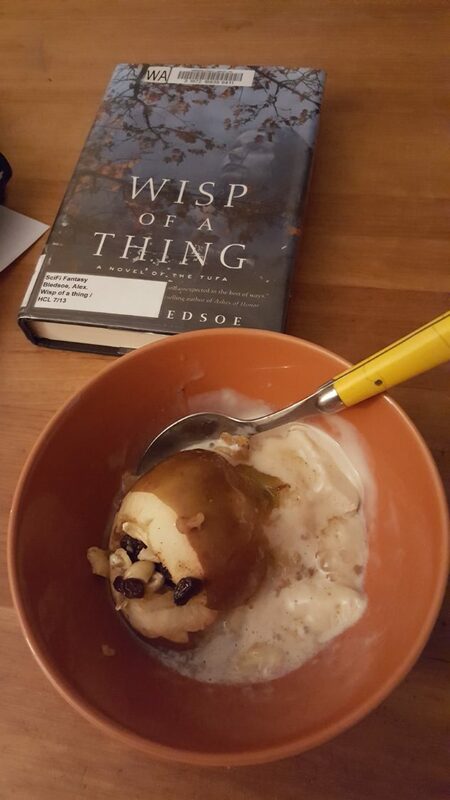 The cookbook says to let the apples cool, but I think serving them immediately over your favorite ice cream, drizzling a little of the glaze over everything in your bowl, is the way to go. I’ve tried with vanilla, salted-caramel vanilla, and vegan Chunky Monkey ice cream, and each was super delicious. A small suggestion if you want to make this over the summer: check out a local farmers market for your apples. There’s an apple seller at the Northeast Farmers Market I frequent who sells a variety of organic apples—they’re a bit smaller than the ones shown here, but I think they’d work really well with this recipe.